I have heard many criticize the Fourth Century church in Rome for taking festivals from Rome’s pagan culture, “Christianizing” them, and keeping them in place in order to be more attractive to the Roman citizenry and thus bring increasing numbers into the churches every week. They go so far as to say that this corrupted the church. But some of those same people have no problem with taking the music, marketing strategies, business practices, holidays (Halloween? ), fitness centers, politically correct philosophy, and morality from our present secular culture, adding some Christian lingo to “Christianize” them, and using them to bring in greater numbers every week. After all, as long as we don’t change the core of our message, that’s what matters, right? Except the message invariably does change in order to be more seeker-friendly and bring in the numbers for services, commerce and financial gain. What is the difference between the 4th Century Roman church and the 21st Century American church? None! Pagan Rome and secular modern culture are both anti-Christ from the word go! They were so disturbed by Christ and His disciples that they killed them at every turn. Yet we spend time trying to be as worldly as we can get away with in hopes that maybe they will like us now. Are we above our Master? They hated Him, and they will hate His followers as well! “If the world hates you, you know that it hated Me before it hated you. If you were of the world, the world would love its own. Yet because you are not of the world, but I chose you out of the world, therefore the world hates you. Remember the word that I said to you, ‘A servant is not greater than his master.’ If they persecuted Me, they will also persecute you. If they kept My word, they will keep yours also. But all these things they will do to you for My name’s sake, because they do not know Him who sent Me. 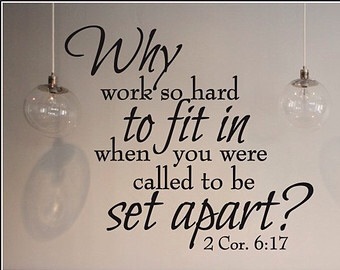 The Church used to heed Paul’s admonition to “come out from among them and be ye separate saith The Lord” (2 Corinthians 6:17). Now we have flipped that on its head and say “make things light and non confrontational so the lost will feel comfortable and want to come in amongst us”. May I submit to American Christendom that a sinner should not be comfortable inside our churches! The convicting power of the Holy Spirit should make a sinner distinctly uncomfortable. It’s called conviction of sin, and it is one of the reasons the Holy Spirit was sent! Instead we draw them in with consumerism, customer service, and entertainment. But those who are drawn by the entertainment will need ever increasing entertainment to keep them coming back for more! So enough of secular, commercialized, comfortable American church-ianity. Away with WIIFM (what’s in it for me) messages and philosophy! We desperately need world shaking, sin convicting, life changing Christianity that is able to go forth in spiritual power and call the lost out of the secular world to faith and repentance and discipleship!